THE SCHLAGER SYSTEMS: Pop Pow Wow! 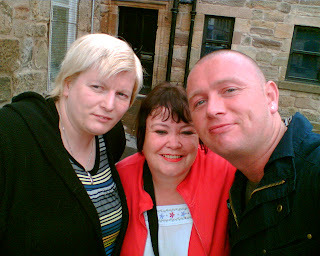 There was meeting of minds the other day when The Vodka Systems representatives Marty and Shona met photographer and publicist Moira 'Madame Tempus' Ferguson to discuss the add campaign for the new TVS track 'Glitterbal Of Love' . 'Glitterball' was to be entered into the Swedish Melodifestivalen for next year but fell at the first hurdle as none of the writers are actually Swedish! So the song will go ahead later in the year for a Joint UK and Nordic Release as a single for The Vodka Systems. The Vodka Systems would like to point out that they are would very much love to enter Melodifestivalen as artists, performing a song by a Swedish writer and are open to suggestions!! !